January 14, 2016 -- Will 2016 see the end of the U.S. government's meaningful use program? The acting head of the U.S. Centers for Medicare and Medicaid Services (CMS) stated as much at a speech in San Francisco, in which he said the program to spur the adoption of healthcare IT was "effectively over." CMS Acting Administrator Andy Slavitt told attendees at the J.P. Morgan Healthcare Conference that because technology has moved into "virtually every place care is provided," CMS is in the process of ending meaningful use. "The meaningful use program, as it has existed, will now be effectively over and replaced with something better," according to a transcript of Slavitt's remarks published on the CMS website. CMS Acting Administrator Andy Slavitt. CMS hopes to replace the program with implementation of the Medicare Access and CHIP Reauthorization Act (MACRA) of 2015. MACRA repealed the sustainable growth rate formula and set the stage for the federal healthcare system to move toward payments based on value-based care. Slavitt noted that CMS has been working with physician groups since late 2015 on changes to meaningful use. Several groups, including the American Medical Association (AMA), have been highly critical of the way the program has been implemented and have called for a pause in its implementation. In his comments at the J.P. Morgan conference, Slavitt said CMS will move away from "rewarding providers for their use of technology" and toward a system based on patient outcomes that result from care. He also noted that healthcare providers should be able to "customize their goals" so that technology developers can build solutions around the needs of practices, not the needs of government. CMS also wants to make it easier for start-ups to enter the healthcare IT space by requiring software to be written with open application program interfaces (APIs) to prevent the "lock" that occurs on the physician desktop by the adoption of proprietary electronic health records (EHRs). "We are deadly serious about interoperability," Slavitt continued. "We will begin initiatives in collaboration with physicians and consumers toward pointing technology to fill critical use cases like closing referral loops and engaging a patient in their care. And technology companies that look for ways to practice 'data blocking' in opposition to new regulations will find that it won't be tolerated." 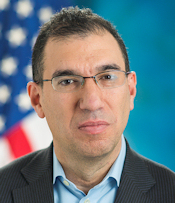 Slavitt's call for revisions to meaningful use and an emphasis on interoperability were echoed by the College of Healthcare Information Management Executives (CHIME). The organization said that while it supports the goals of meaningful use, refinements to the program are necessary to make sure that physicians and hospitals can meet the program's requirements. "We also believe that we need a laser-like focus on interoperability to improve health information exchange across the continuum of care," CHIME said in a statement. "Central to that is finding a safe, accurate, and private methodology for patient identification. Interoperable systems, a bigger focus on outcomes, and less prescriptive use of how technology is used will better position providers for success in new payment and delivery models of care and ultimately benefit patient care."